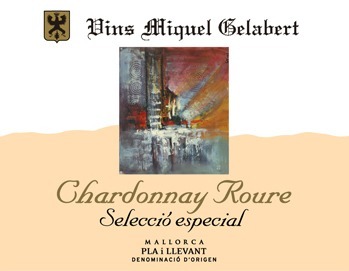 This wine differs from the other Chardonnay in that the grapes are selected even more carefully, the special barrels used are of top quality, and the wine is aged for 10 months. This is a more mature wine, suitable for long ageing and drinking in the next 4 or 5 years. Designation: D.O.P. Pla i Llevant-Mallorca. Type of wine: “Crianza” white. Fermentation: Alcoholic and malolactic fermentation in French oak barrels from Alliers and Nevers. Ageing: 10 months in new French oak barrels and 12 months in bottle. Tasting Notes: Pale yellow, with a touch of gold. Complex and elegant on the nose, where its judicious ageing is illustrated through the notes of smoke and spice subtly combined with an impression of honey and citrus. Full and well structured, firm and fresh (mint) on the palate, displaying the perfect combination of power, subtlety, smoothness and crispness. Its personality is clearly shown by its elegant and pleasantly aromatic finish. Food pairing: pairs well with fish in sauce, casseroles, baked fish and white meat. Serving temperature: between 8-10 ºC.